Antivirus protection doesn’t have to be expensive to be good. What is the best free antivirus solution? Now you don’t want to mess around when it comes to protecting your computer. You want a product that scans, detects, and removes viruses VERY effectively. First, Bitdefender (talking about the “pay for” variety for a moment) has ranked first for detection and removal in independent tests for the last three years running. The Free edition is not as flexible or as full-featured, but does an excellent job. It is available for home use only. The more robust “pay for” edition can be purchased from their web site, and is often on sale for $20 or so (as of May, 2016). But that’s not all. Most computer users are not equipped to answer a program that essentially says, “I’ve found something really dangerous on your system, now what do you want me to do with it?” Would you hire an exterminator who asked you each time he found a bug what you wanted done with it? Bitdefender (both free and commercial) is the least obtrusive antivirus program I’ve ever seen. And the Free edition doesn’t constantly nag you to upgrade to the professional edition. It quietly sits there monitoring and scanning your system, and notifying you only when it has updated and when it has completed a system scan. You don’t even need to close the notification. It does it for you. How great is that? If it finds a virus, it automatically renders it harmless, quarantines it, and then deletes it after a specified time period. You never have to do a thing. 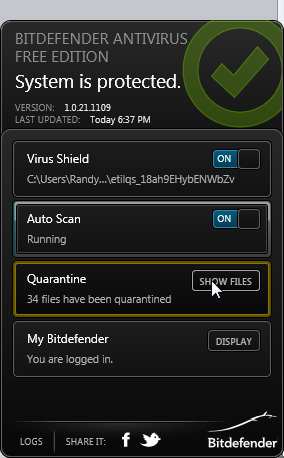 If you want to scan a file or folder, perhaps an installation program before you install it, just right-click on it and choose “Scan with Bitdefender.” It will scan the file(s) and report the result. Just so you know, the Free edition does require you to create an account on their website before you install the product. Then, after it installs, you have to log in to the product using the credentials for the account you created. But you only do that one time, right after the install. After that, everything runs on automatic. If you get curious, you can examine the scan results, and even see the files it found. You can read all about this insidious crippling malware in another post on this site.